Vientiane hasn't got the obvious charm of Luang Prabang and sometimes suffers by comparison. Against that, Laos' capital has more in the way of traditional tourist attractions, and has put much effort into encouraging sustainable tourism. Visitors won't struggle to find interesting things to see and do, and many fall in love with the city's relaxed atmosphere and sleepy riverside scenes. Vientiane's many Buddhist temples are its main drawcard and are interspersed with modern and colonial architecture - as they are throughout the country. 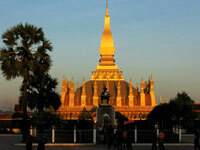 The old and grandiose Ho Phra Kaew and the famous That Luang (the golden Royal Stupa) are among the city's best. Wat Si Saket is another favourite, and is known for its thousands of Buddha images. Travellers should note that although the temples in Laos are incredible, they tend to be fairly similar. Tourists should only stop at the best ones to avoid temple fatigue. A visit to Vientiane should also include shopping in the Morning Market (Talat Sao), a stroll through Victory Gate, a cooking course on the banks of the Mekong River, a craft class at the Houey Hong Vocational Training Centre for Women, and an educational trip to the COPE Visitor's Centre. Regarding excursions, the weird but wonderful Buddha Park (Xieng Khuan) is a good option. So too is the small, laidback town of Vang Vieng, which is surrounded by green agricultural fields, friendly Hmong and Yao villages, and mountains that hold fascinating limestone caves. We are looking for contributors for our Vientiane travel guide. If you are a local, a regular traveller to Vientiane or a travel professional with time to contribute and answer occasional forum questions, please contact us.